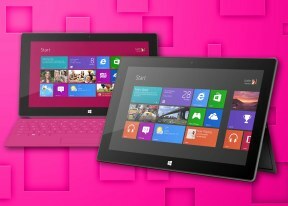 The Microsoft Surface has two 1.2 MP cameras on board capable of 720p video capture. There's also an 800p option, which produces 1280 x 800 pixel videos. The interface is basic to the point of being almost nonexistent. A tap anywhere on the screen is how you snap a photo or start recording video. You can switch between the front and back cameras, adjust picture size, enable a 3 second timer and toggle picture and video mode. As you might expect, the Microsoft Surface wasn't made with photography in mind. The two cameras on board are merely there to serve as web cams for those Skype calls. Images have a resolution of 1280 x 800 pixels and their quality is poor. The camera also appeared to have some lens issues, which we gather from the overly smudgy left side of the images. The videos produced by the Microsoft Surface's back camera are atrocious. There's almost no resolved detail and colors are way off. The Surface at least records stereo sound during playback with a bitrate of 169 Kbps and 44 kHz sampling rate. The video bitrate is around 8 Kbps and the framerate nails down 30 fps. We've uploaded a sample to YouTube, here it is. Here's an untouched 720p@30fps sample for direct download. Windows RT comes with two browsers preinstalled and offers no other options for now. Internet Explorer 10 handles the web and comes in two forms - one in the Modern UI with a touch-centric interface and the more conventional Desktop version, which is basically a port from Windows 8. In Modern view, IE 10 runs in full screen by default. A swipe from the bottom or top edge of the screen reveals the opened tabs on top with a New Tab option, a new private tab and close all tabs. At the bottom is a back button, the unified search/URL bar and options to refresh, pin the current page to start, forward and an extra menu with find on page, view on desktop and "get app for this site" options. Sharing pages can be done via the Charms menu. Pages can be shared over Mail or the People app, meaning Facebook or Twitter. Interestingly, if you want to change preferences or settings you can only do so in desktop IE 10. IE 10 in desktop mode features a unified URL and search bar, the opened tabs and three virtual buttons for home, bookmark and settings. Opening up a new tab prompts a thumbnail collection of recently opened tabs. IE 10 is fully Flash-enabled. Watching videos inline is done exactly as you would on any desktop PC. We didn't experience any problems with videos at 720p and even 1080p. Internet Options is a direct port from IE 10 on Windows 8. You can set a home page, choose the level of security, privacy, control the intern content connections, etc. There's an option to open links directly from Internet Explorer in Modern or Desktop mode. Internet Explorer has come a long way and isn't the once clustered, slow browser many people used only for downloading Firefox and Chrome. In our web browsing test the Microsoft Surface achieved almost 8 hours of constant browsing.